As the D1NZ season comes to an end, the drivers meet for the final round at Hampton Downs. This will decide who wins D1NZ overall and the D1NZ Rookie Series. On Thursday all the drivers and their teams decended on Hampton Downs for their chance to tweak their setups and get to know the circuit before the big day. Many of the drivers such as Carl Ruiterman worked on their cars before getting out onto the track to get a feel for the track. While other cars chilled looking good. Jake Jones’ ‘Sonvia’ was doing this quite well. Even car-park-cars were looking great. This 180sx with its wide body kit and flush fitment had a somewhat army look going on. Daynom Templeman was out in force with his RX7. Unfortunatly due to engine problems, he was unable to compete in the final. Our man Sky Zhao was getting some nice clean runs. His recently installed Sinco Manifold allowed him to really give the car a push. 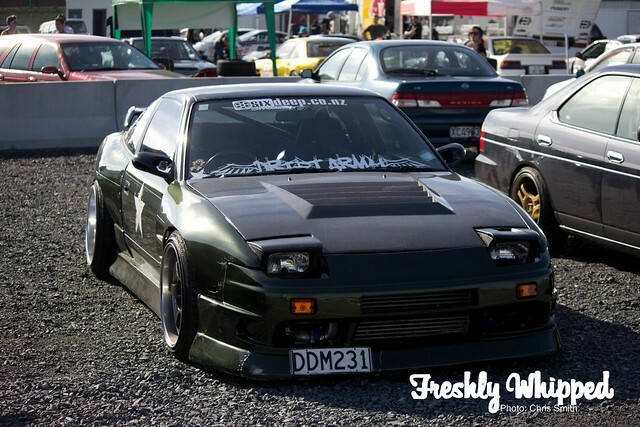 Bruce Tannock’s S13 with a Rocket Bunny kit has many drooling as it slides past. Mad Mike’s 26b RX7 was providing a near F1 tone. Clearance under his car is at a premium. Keeping the RX7 theme going, Andrew Redward had his FC out sliding. Sadly he had some problems with the car, meaning he couldn’t run it on Friday. Jake Jones the Australian had his ‘Sonvia’ sliding with the big boys, giving many of them a great run for their money. Hopefully we’ll see Jake back next season. 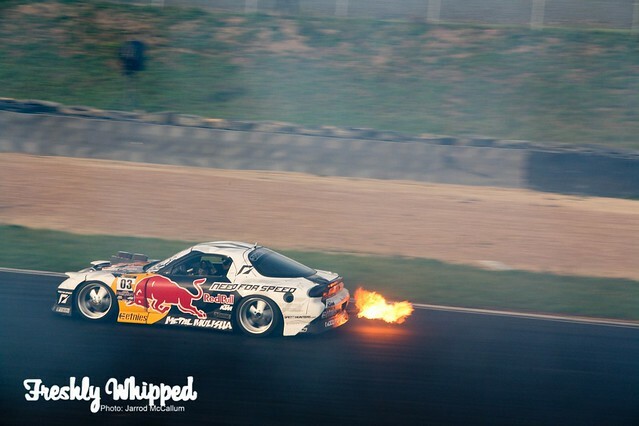 Mad Mike’s RX7 sure has a temper. “It’s fully sick, it just oozes style.” Catch the quote..? Overall the day allowed the drivers to see if their cars were ready to handle Hampton. Sadly some couldn’t. More photos available here and on Facebook.